The Vancouver Asian Heritage Month Society (VAHMS) is proud to organize a number of activities in support of our vision to recognize Asian Canadian participation as an integral part of Canadian society and celebrate the hybridization of all arts and culture in Canada. 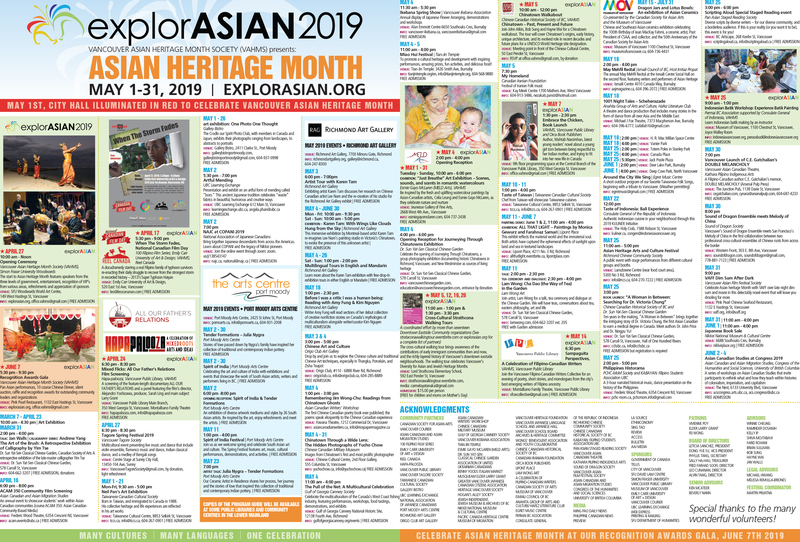 explorASIAN is an annual festival organised by VAHMS that takes place each May to coincide with the National Asian Heritage Month across Canada. The festival includes art and cultural programs, activities and events produced in collaboration with various partners from the diverse communities in Metro Vancouver. explorASIAN hosts a Recognition Gala at the end of the Festival each year to honour outstanding contributors from the selected community and celebrate with new and old friends alike through unique performances, music and food. See this year’s explorASIAN 2019 festival guide.